For the last 20 years, backpacking has become a passion. I am a four-season backpacker and an off-trail navigator. Although I do take yearly trips to the American West or Southwest, the majority of my trips are in Michigan. My pack weight varies considerably but my base weight is below 18 lb (8 kg). I am primarily a Tarptent camper who averages more than 50 nights a year backpacking in a huge variety of weather conditions including relentless rain, wet snow and sub-zero temps. The Grangers Footwear Care Kit arrived with four products inside. 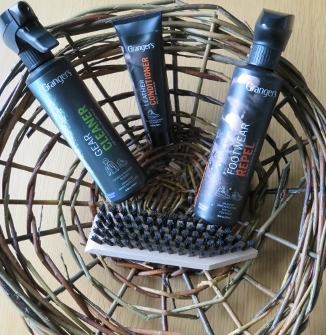 They are Footwear Repel, Gear Cleaner, Leather Conditioner and a Boot Brush. The manufacturer uses symbols for the kit which represent that it is suitable for cleaning, maintenance and waterproofing for the all-in-one kit. I was impressed with the size of these products as I likely will be able to use them on several items of footwear/gear. The products do not however hint at how many items can be processed. I think it is important to note that this manufacturer has been around for 81 years. That is quite the history. The company is base in the United Kingdom. Gear Cleaner. This product can be used for footwear, clothing and equipment. It is a spray product that reportedly removes odor, maintains water-repellency, maximizes breathability and restores the original performance of a fabric. It can be used on all fabrics including Gore-Tex and eVent membranes. It is Bluesign approved meaning the product is environmentally responsible and water based. It still shouldn't be used by children and I should be careful not to get it on my eyes or skin. Basic instructions for use are printed right on the product. They are: 1. Close zippers and Velcro flaps, 2. Spray onto affected areas, 3. Wipe clean with a damp cloth. More instructions can be found on the website. They include removing shoelaces, brushing off loose dirt, and leaving the footwear to dry naturally after cleaning. Footwear Repel. As noted on the spray bottle containing the Repel fluid, it is for all footwear materials. They include full-grain leather, nubuck, suede, and fabric footwear. I have footwear in all categories so can't wait to test it out. According to the manufacturer the "spray-on application repels water and stains whilst maintaining breathability". Directions include: "Remove any loose dirt, Shake bottle, Apply spray evenly to damp footwear and remove any excess from soles and welts". Further instructions are online and include a note to dry naturally. This is also a Bluesign approved product and has the same warnings as the gear cleaner. Leather Conditioner. This creme-consistency product can be used on full grain and smooth leather. Usage instructions were found on the website rather than on the product. The first step was to apply the product sparingly to clean leather. The conditioner should then be rubbed in a circular motion so that all seams and joints are treated. Two or three coats are ideal with a drying period in between. Footwear Brush. The tapered wooden-handled brush is quite adequate in size. The base of it is about 7.5 in by 2 in (19 cm by 5 cm). It can be used on all types of footwear. Directions on the website include holding the brush tightly and then applying a light pressure on it to remove dirt. For harder to remove dirt, the pointed end of the brush can be used but it warns to be careful with use to avoid scratches. The Footwear Care Kit is a complete system for taking care of footwear and gear. I am looking forward to using it to clean up some of my backpacking footwear. 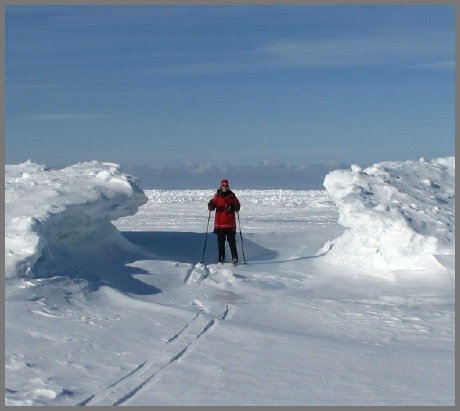 During the test period the weather has varied a lot but it has been mostly winter conditions. I must admit up front that I always procrastinate about cleaning footwear. 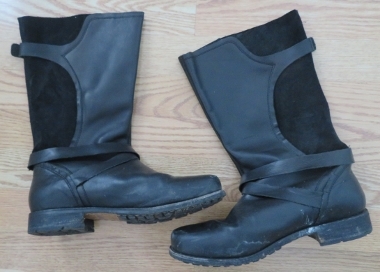 Any boot that goes from muddy times in the fall into clean white winter conditions naturally cleans itself! That said I do have several pair of shoes/sandals, and boots that did not get the winter cleanse. The first was a pair of Oboz sandals, the second a pair of Altra running/hiking shoes and a pair of Oboz hiking boots. I also have a variety of winter boots that needed some waterproofing and conditioning. 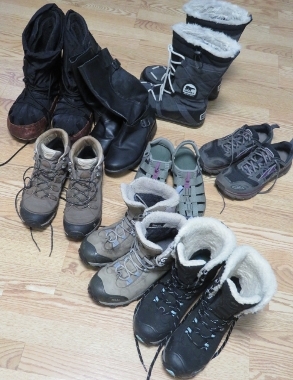 They are leather dress boots (Olu Kai), Oboz winter boots (two pairs) and mukluk-style boots (Sorels). I also conditioned the leather on my Empire Canvas Works True North muk-style boots. My Empire Canvas Works True North Boots are built partly with bison leather. I treated the bison leather with the conditioner. The rest of each boot I left alone as they are not meant to be waterproof. My casual leather boots which are all leather and suede are in really good condition but I did have some salt residue on them. I used the cleaner to refresh them and then I used the leather conditioner on the smooth leather areas. Most of my footwear did not have a lot of mud on the soles but on the ones that did, I used the brush to clean out the guck. I think foremost the part I like about cleaning boots with the Granger products is that the cleaner is a spray. After spraying the footwear all I had to do was use a clean cloth to remove the dirt. And was the white microfiber cloths I first used ever filthy! I changed to dark gray ones after the first ones proved how much dirt came out. This is way more efficient than my old method of completely wetting my footwear and scrubbing it with a brush. It took forever to dry and I only did it when it was absolutely necessary. This makes life so much easier and I likely won't be as reluctant to get the job done in the future!! 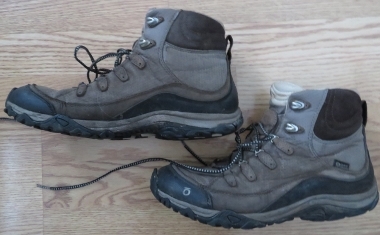 One thing that always bothered me a bit was that the leather on my tan-color Oboz winter boots has always appeared wet although my feet stayed dry. I was quite keen on seeing if this would happen with the waterproof spray being applied. Happy to report that it did the trick. I also used the waterproof spray on my Sorels and my second pair of Oboz Bridger winter boots. I actually went into the unheated garage to spray the footwear as normally waterproof sprays are very strong smelling. I was pleasantly surprised that the smell was very light. All in all, I am quite happy to have a whole rack of clean footwear and procrastinating to start the process was a waste of time. I'm sure I'll look to the products to help me in the future. Thanks to Granger's International, Ltd and BackpackGearTest.org for this opportunity to test the footwear products. This concludes my test report and the test series.